“As of...”? So it begins in Incontinence-Pant-Time and then progresses? Or what? The ETA has been running for eight of these pesky Subsidized years, so presumably Depend is the eighth of those; and there’s a reference to the days before Subsidy, so *something* happened, *something* changed. We’re working towards a revelation, I’m guessing. But not right now. Instead, we get the back story of James Incandenza, aka Himself, and a man, it seems, of multiple parts. For a start, family dysfunction is not simply something he spawned; he was born with it coursing through his veins, courtesy of his “dipsomaniacal tragedian” father, hinting at something tragicomic and Dickensian. Young James O is bred to be a tennis prodigy and an inventor, the skills from the former and the cash from the latter – “after an early retirement from the public sector” – combining to build the Enfield Tennis Academy. But via the potted biography, we get some pretty good hints at what’s been going on in this alternative timeframe. 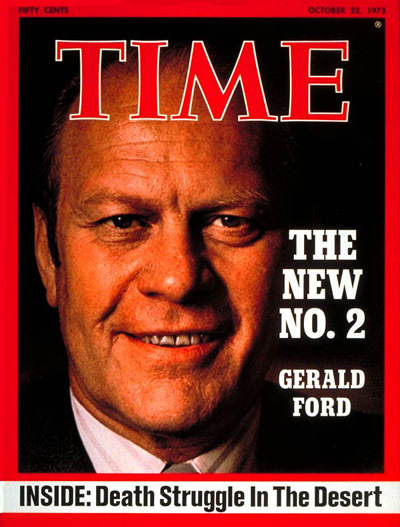 The “Federal interval G. Ford-early G. Bush” represents (unless history began going askew before this) 1974 to 1992, from the fall of Nixon to the arrival of Clinton. But why is it described thus, as a discrete segment of time? Is it something to do with Incandenza’s research that helped the US towards energy independence; the early 1970s being the time when oil prices really kicked off? Was 1992 a time when everything got better? And what happened to Ronald Reagan? And, while we’re at it, this isn’t the first time that we’ve had oblique references to Canada, which seem to imply that all is not well within that delightful, if climatically challenging land. Are they at war with their loud southern neighbour? Ah, the Moms was a professor of Prescriptive Usage, which – one might assume, given the various goings on we’ve seen already – is something to do with drugs. But at the same time it might be about language. 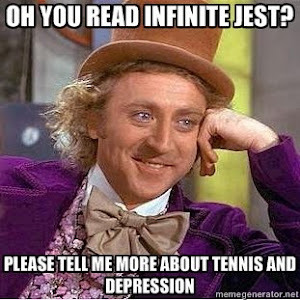 Or both, of course; and the language of drugs has occupied a decent chunk of the footnotes up till now. Talking of which, it’s here that the footnotes really start to take on a life of their own and the monumental note 24 (Incandenza’s filmography) really deserves a post in its own right. So that’s what it’s getting. Two more things: we’re still using ARPANET, which predated the internet; and an explanation for Orin’s huge limbs appears to be imminent. And while we’re on the subject of Orin, here he is in Denver, skydiving onto a football field, dressed as the bird that gives his team. For all I know, this is how NFL games begin these days; when I watched the last Batman movie, in which a game is interrupted by the pitch opening up and swallowing most of the players, I thought it might be a pretty cool way to inject some interest into a pretty stupid pastime. Didn’t they talk about Gerald Ford having played football without a helmet? Well, then. Oh I get it now. Arizona Cardinals... New Orleans Saints... Do the Browns dress up as turds? And now I’m really confused, because we have one of those circle motifs that herald a new chapter, but there’s no title and in Kindle terms it’s not a new chapter and now we don’t know when we are. Still in Depend, I’ll have to guess. And presumably at ETA, where Hal’s classmate Michael Pemulis is giving a lecture on drugs (prescriptive?) to the younger students. But they’re not desperately interested in such matter-of-fact analysis, which hints at the notion that if all drugs were legal they’d lose their outlaw cachet and usage would fall off. This segues into a meditation on drug use at ETA, which first of all I think might be delivered by Pemulis, then I think Hal, and finally Orin, but I’m still not sure. No, it’s not Pemulis, because he refers to “the Moms”. Unless, of course, the Moms is an ersatz mother figure to all ETA students? In any case it turns into a dream, so any search for logical links might turn out to be a waste of your time and mine. The court becomes some unnecessarily complex construction, as if MC Escher had taken up real tennis. Although inevitably a dream/nightmare court summons up images less of tennis, more of a prosecution, more Kafka or A Matter of Life and Death.